Gideon was the only one of his siblings to survive being cruelly dumped in a field, and now, thanks to his rescuers and the support of everyone who's been anxiously following his story, he's made an incredible transformation from weak and starving to playful and affectionate. 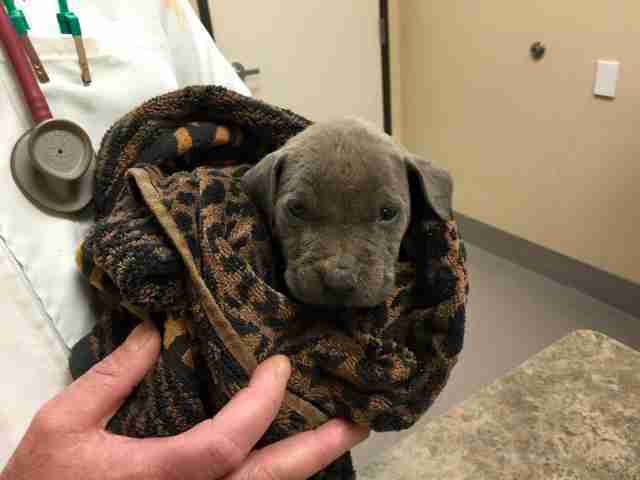 The tiny pit bull puppy and his five siblings were abandoned in Madera, California, on Monday. A good Samaritan discovered them in trash bags, and Gideon was the only survivor. 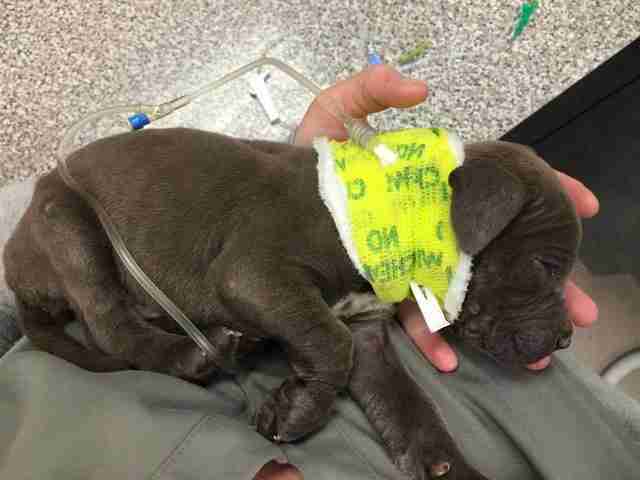 The 4-week-old pup was malnourished, dehydrated and in dire need of medical care. According to an update from Fresno Bully Rescue, the young man who found Gideon "rushed to give him formula and water," and then took him to Abby Pet Hospital. Gideon is still recovering at the hospital, and as he gets better his "spunky" personality is starting to come through. "He goes between being a super snuggler and wanting to be real rowdy," Cecilia Wright, a practice manager at Abby Pet Hospital, in Fresno, told The Dodo. Gideon isn't out of the woods yet, and only time will tell if his tragic start has left him with any permanent health issues, but Wright said she's "hoping he'll be given the opportunity to be a puppy." 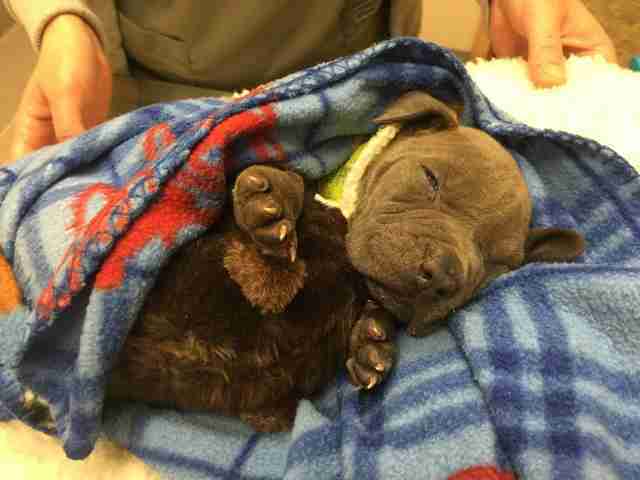 He'll be off his IV and rid of his parasites soon, and once he's ready, he'll go to a foster home. Madera County Animal Control officers are still looking for whoever callously abandoned Gideon and his littermates. When owners don't spay and neuter their pets, those pets can have unwanted litters. Thousands of those puppies, like Gideon's siblings, never get a chance at the happy life they deserve. If you're ready to give a puppy a forever home, visit your local humane society or search on Petfinder. And visit this page to donate to Gideon's medical care. 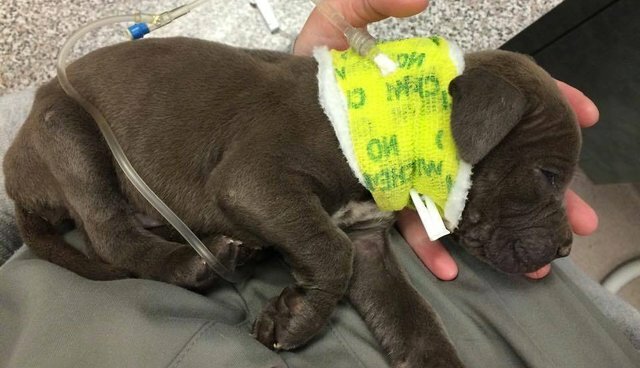 We're rooting for you, little guy!